The Honeywell WA7626-CA is a SMA to N adapter cable to interface outdoor antenna extension cables. 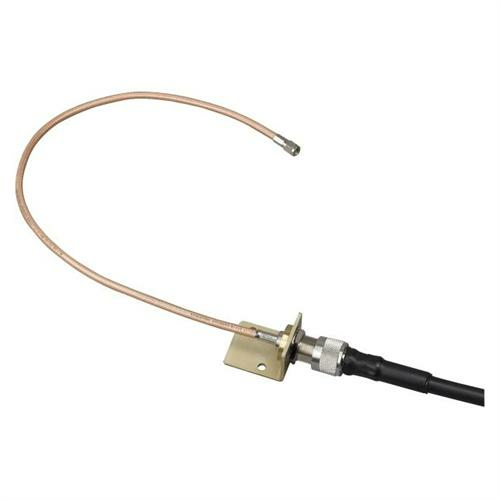 The WA7626-CA connects one of the 7626 AlarmNet cellular antenna extension cable(s) with the K14207LF MMCX to SMA adapter cable. The WA7626-CA is not included with the antenna, but is included in the antenna kits. Installations requiring Earth Ground Fault detection, Commercial Fire, are being affected by the inadvertent grounding of the WA7626-CA mounting bracket. This affects GSM series communicators such as the GSMCF, iGSMCF, or the IPGSM-COM. The solution is to install a nylon shoulder washer under the mounting screws (2x). Keeping in mind, it may also be necessary to install tape in-between the bracket and mounting surface, if it is metal.